It is very disingenuous of people to blame the Europeans (and other Divisions) for not paying their “fair share” of NATO (tithe) expenses when they are in fact paying what was agreed to as their fair share. I think people can fairly question the viability of sending most of the collective cash upwards… to an organization that’s far detached from local needs. For example, our conference channeling back some of the evangelism funds for church planting, which few people in our church would like to get going with… and it’s a year-long application process to get $7500. It’s a joke! Our congregation funnels almost twice that much in evangelism offering alone. Not even speaking about tithe. And then we have to gravel and beg for some of that money back and have to prove ourselves “responsible Stewart” to get that much? It’s absurd! “Renting” the church buildings and property from the Conference. Please tell me that’s not the case. I agree there needs to be accountability. My point was that there is an agreement in place regarding the amount of tithe each Division will forward to the GC. To say that the Divisions that are paying as per the agreement is disingenuous. Strike a new agreement if the terms are no longer acceptable. The bulk of money, whether at Local Church, Conference, Union, Division or GC, should be spent on discipling (is that a real word?). If you divided the expenditure between “hardware” (infrastructure), “software” (spreading the message) and “wetware” (people) most of the money would be going on hardware and wetware. SDA is a brand, an identifier. Some people self identify, others are branded based on behaviour of belief. In marketing sometimes a brand needs to present “category” messages, particularly if the category has had bad press or is not well known. When a brand builds a category story, they are identified in the mind of the populace as the category. When people think of cornflakes they think Kelloggs. Perhaps Adventists need to do more category stories, stories about christianity. Get people to buy into the category and then the brand. It is much easier to sell a peanut butter to someone shopping in the spreads aisle than someone shopping in the deli. Back to your original point - the money needs to be more readily available at the local, community level. More smaller, locally involved churches and groups. Less big, “insulated” churches. Why does the GC need so much money? To do what with it? The NAD can invest the money in evangelism much more effectively than the GC. By the way, do you know how much money the GC has invested in banks? Why do they need more?.. Perhaps Adventists need to do more category stories, stories about christianity. Get people to buy into the category and then the brand. It is much easier to sell a peanut butter to someone shopping in the spreads aisle than someone shopping in the deli. The present day Adventism is very “Keynesian” in its approach to the future. The thinking is that in the long run we are either dead, or Jesus will be back by then. After all, it was born out of the “set date of the second coming” expectation, and it progressed to “almost almost almost almost now”… and such has been the focus and leadership training. Such is the Adventist narrative that will not be changing anytime soon given who is in control and the preference views of the major demographic of Adventists - 50++ crowd. I know there are 50++ here who have differing viewpoints. I don’t want to lump all of them together, but the dominant view is that there is no long-term future for the world. I’m sure there’s plenty of room for the future in terms of the operational leadership, which is more rational and pragmatic. Theological leadership is neither of that, and it’s very difficult to approach via multiple categories you are talking about when the eventuality of the Sabbath morning sermon isn’t about these categories at all. It’s generally geared to pacify the existential fears of 50++ crowd and ensure them that the promises made in the past for which they invested billions towards … are almost almost almost almost … any moment her now. I would say even beyond that, pastors should be accountable and fit the needs of local congregations … in such they should be someone who knows that congregation the best, and that wouldn’t be someone strolling in from differed area. Should be someone who has been there for years. Knows the people in the area. Understands their needs and struggles, and most of all, understand what the operational cost is in the area. We should send out younger people and pay for their pastoral education with stipulation of the coming back and serving in their local communities. Yet, even that is not happening, since the rotational structure has a very purposeful pastoral loyalty channeled toward their “employees”, and as such many pastors don’t really care much to know people at all. Many don’t care about community needs … Because that’s not where the accountability is. The old nonsense story of “none of this is yours… It’s God’s and we are merely managing what’s God’s” is not sustainable. The Biblical model is communal ownership at the level of locale. We are far from that model. 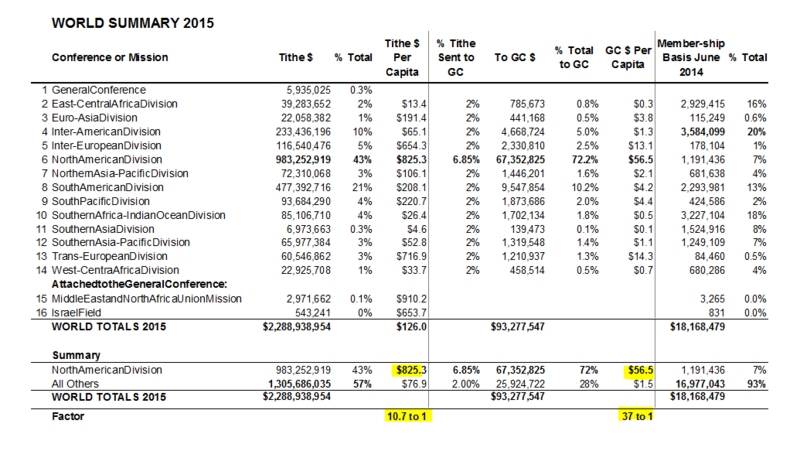 To understand what this means, if you look at the 2019 General Conference budget and move the NAD’s contribution back to 3.8% you would take out of the GC budget $23,475,459 which is about the amount of the tithe budget for the other divisions. The NAD, at 7% of world membership, contributes 72% of the tithe to the General Conference. The NAD contributes $56.50 per person in tithe to the GC. The rest of the world, $1.50 per person. So, per person the NAD contributes 37 times the rest of the world. I realize that many or most people in the world are disadvantaged economically. However when an entire Division, Southern Asia - which is India (soon to be the third largest economy in the world), contributes literally only 10 cents per person per year in tithe to the GC, it does imply a certain difference in expectations could be seen as unfair. In my Sunday church I have seen the difference between them and my SDA. Sunday in the Parish Hall are tables, chairs, coffee, tea, hot water for hot chocolate. to the church and it becoming a program ‘promoted’ by the rest of the church. The big issue with that type of thinking (as I see it) is that by insulating themselves, and focusing on their own preparedness they are consigning billions to the scrap heap. “Almost almost almost almost now…” should provide the impetus to reach out to others, not reach inward. That said a lot depends on the model of salvation that an individual favours - Grace or Works. God’s grace is for everyone period. You only miss out is that is your choice. I do believe we are in favour of the same thing. Not many of the soon to be or existing billionaires in India are members of the SDA Church. Mostly the SDA Church members in Africa and Asia come from the bottom end of the economic spectrum. At best they come from the lower middle. Not many of the soon to be or existing billionaires in India are members of the SDA Church. Mostly the SDA Church members in Africa and Asia come from the bottom end of the economic spectrum. I haven’t seen such data about membership. I looked but didn’t find it. Do you have a link? I do understand what you’re saying in concept, and I made note of it in my post. I’m not one to prop up the non-biblical and disingenuous tithe system the SDA church operates. But at the same time I see little reason for the NAD to support something like three quarters of the GC’s budget when we are 7% of the church. If the GC tax can’t be fairly distributed (say everyone pay 3%) and still say afloat, then they are too expensive to exist as they currently do. I didn’t even get into how much tithe is sent to support the Divisions. I think there’s a similar apartheid system there as well. The GC doesn’t seem to make this easy to find in their reporting. The growth in membership is due to the evangelists in the growing divisions not funding from the NAD. Is growth also not due to the vast educational system Adventism has in place worldwide? Teachers and professors are the most effective evangelists the church has anywhere. Lack of money is not our problem. Our problem is lack of commitment and faithfulness. I don’t think the issue being raised by the NAD pertains to the GC not having any need for the money that they currently receive. The NAD’s issue is that they want to give less to GC and have the other divisions with less tithes give more. I don’t have a link but lived on the sub-continent for12 months. Most of the members I came across were lower middle class. I don’t recall meeting any that I would call upper middle class.